Good Technology's quarterly Device Activations Report (PDF) for quarter four 2012 found that Apple's iOS garnered nearly 77 percent of all activations for the sector, up from 71 percent. In comparison, Google's rival Android mobile platform dropped from 29 percent of activations to 22.7 percent over the same period. For the study, Good, which provides security mobile device, app and data security, analyzed activations across its network of over 4,000 corporate customers, which includes half of the Fortune 100. Apple was clearly dominant during the three-month period, with the iPhone 5 itself accounting for roughly nearly one third of all device activations. The iPhone 4S and iPhone 4 followed, showing a slight increase bump in activations for the quarter attributed to the annual price drop Apple employs when a new flagship model is released. Rounding out the top five was Apple's third-generation iPad and the iPad 2. 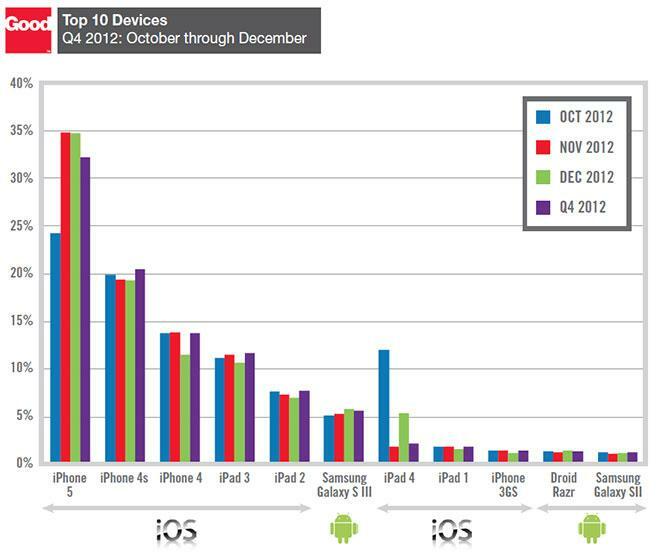 Android's top performer was Samsung's Galaxy S III, which netted six percent of total device activations, good enough for sixth place. Despite owning a lion's share of the enterprise tablet market with an over 90 percent share, Apple faced rising competition from Android devices, the activations of which jumped from 2.7 percent to almost 7 percent. It should be noted that so-called "phablet" devices like the Galaxy Note were designated as tablets for the study. While iOS and Android continue their duopoly in all things mobile, Microsoft's Windows Mobile platform managed to eke out a bit of marketshare with the decline in Android activations. 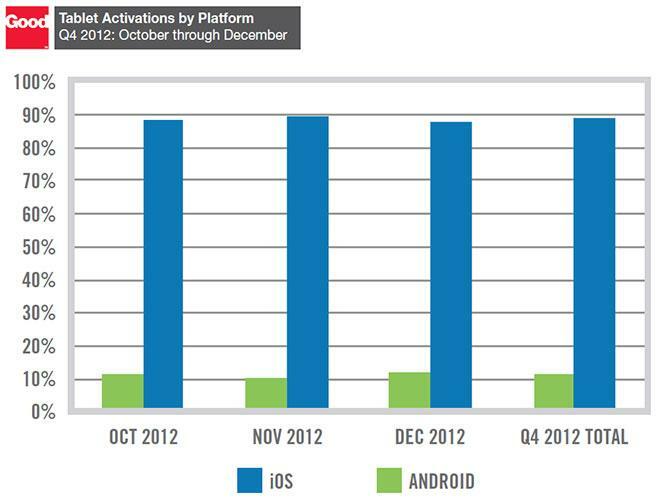 Overall, Windows devices accounted for 0.5 percent of total activations for the quarter. For the coming year, Good expects more device diversity in the workplace as enterprise embraces the bring your own device (BYOD) movement. By allowing employees to use their own equipment, corporations can see reduced IT costs and higher productivity as workers are able to use the devices they are most familiar with.